The Bucking Mules: Luke Richardson, Joseph Decosimo, Karen Celia Heil, and Joe Dejarnette in Floyd, Virginia. 2017. The Bucking Mules throw down some of the most exciting and engaging Old-Time music being made. Drawing from their deep study of old 78s and visits with older master musicians, the Mules distill the tradition into driving, heartfelt performances. With drive and verve, they have initiated the uninitiated many the festival goer into the wild world of Old-Time music. A straight-shooting Old-time string band, The Bucking Mules deliver American old-time music at its pure and joyous best. Their new full-length record Smoke Behind the Clouds features 17 mostly traditional songs treated with the Mules’ characteristic throw-down groove. The band cut their teeth in Tennessee, North Carolina, and Virginia through extensive time spent with old 78s and elder master musicians from the region. The result is a group of well-studied musicians who know how to bust down on a fiddle tune, belt an old song, and move square dancers. On Smoke Behind the Clouds, the Mules traverse the traditional musical landscape of the Cumberland Plateau, the Tennessee River Valley, the Blue Ridge, and beyond. Favoring spirit and simplicity over pretense, Smoke Behind the Clouds distills a reverence of the past into a driving, heartfelt record tailored for contemporary fans of folk, old time, bluegrass, and more. 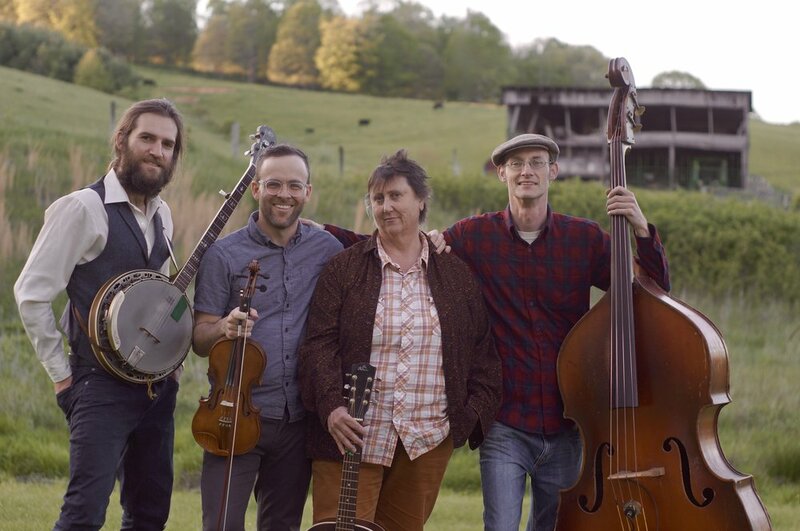 With top-shelf playing and delightful quirkiness, the Bucking Mules’ stage shows have won over folk, bluegrass, and old time fans on both coasts and abroad. They know how to bust down on a fiddle tune, belt an old song, and move square dancers. Some of the most exciting and accomplished players in the genre today, they are experienced and engaging performers, peppering performances with stories about the people and places that have given rise to the music. Their sets deliver sizzling old time fiddle and banjo based tunes, old songs in harmony, and instrumental change-ups. They know how to boil and simmer. After all, the band members cut their teeth in Tennessee, North Carolina, and Virginia—in the very communities that have sustained the tradition. With a handful of blue ribbons and extensive teaching experience, the Bucking Mules' drive and groove appeal to audiences far beyond the world of old time music. This band has gotten audiences grooving at notable festivals like the California Bluegrass Association's Father's Day Bluegrass Festival, the Minnesota Bluegrass and Old Time Music Association Festival, the Nimblefingers Festival, and Clifftop. Raised in East Tennessee, Joseph keeps the musical traditions of his region alive. In his teens, he spent much of his time with the region's older fiddlers and banjo players, learning their music and stories. Drawing inspiration from these encounters and from the region's deep musical well, he injects new life into the old tunes. A sought after performer and teacher, he has shared his music at festivals, camps, and venues throughout the country and abroad. His fiddling and banjo playing have won blue ribbons at the most prestigious fiddle contests in the South. He served on the faculty in ETSU's Bluegrass, Old Time, and Country Music Studies Program. A trained folklorist, he is recently completed his PhD. Luke’s music rolls with the arresting and subtle beauty of the hills around his family's farm in Lawrenceburg, Tennessee. With an intuitive ability to match the fiddle, both on banjo and harmonica, Luke pushes the music along with grace, ease, and drive. A practitioner of multiple styles of old time banjo, Luke explores the potential of the banjo in a strikingly creative yet regionally-informed way. His banjo playing has earned him two National Old Time Banjo Championships. His fiddling, ace harmonica playing, and singing bring texture and range into the Mules' performances. A cosmopolitan old time musician who has been a key feature of old time scenes from Brooklyn to the UK, Luke is an in-demand old time performer and teacher. One of the finest guitarists on the Old Time scene and beyond, Karen lays down a driving foundation for the Mules to work their magic. Her singing brings the Mules' performances emotional richness and depth. Cutting her teeth in California's rich traditional music scene, she began making pilgrimages to Southern fiddler’s conventions, eventually finding herself in the living rooms of the region's master musicians. A fun and skilled teacher of fiddle and guitar, Karen is an esteemed instructor in the Bay Area and has taught at the finest music camps and festivals. Her performing experience includes being cast in the award winning production of the musical “Fire On the Mountain” (2015) and the Kate Weare Dance Company production and recording of “Brightlands” (2011).